The bulk of transition studies define the initial transition point as when young people make a transition from compulsory education into the labour market, further study or inactivity. However, in stratified education systems in which pupils are streamed into different academic and vocational trajectories at an early age, the transition process begins much earlier, as educational tracking clearly shapes the future conditions of the transition process. 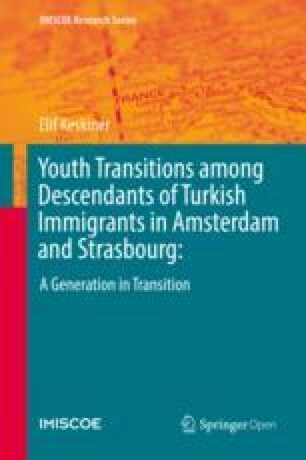 Thus, in order to underline the retrospective nature of transitions, I will focus on the experiences of early educational stratification among native-born descendants of immigrants from Turkey in Amsterdam and Strasbourg. Studying this early transition provides an opportunity to unravel the working of social class, gender, ethnicity and the application and development of cultural capital in facilitating the transition decision. Over the last two decades, numerous studies in the field of social stratification have confirmed the link between educational tracking and its consequences for the labour market (Van De Werfhorst and Mijs 2010). Various cross-national studies have demonstrated how the school-to-work transition process varies according to the level of stratification across education systems, as well as the occupational specificity in training systems where there is a tight match between skills gained in training and employer expectations in the labour market (Allmendinger 1989; Kerckhoff 2001; Mueller and Shavit 1998). Drawing on these findings, we can deduce that initial educational stratification will have significant consequences for pupils’ future transitions. Therefore, this streaming is the first major transition that pupils experience. The first part of this chapter describes the Dutch and French education systems in detail, with particular emphasis on their respective stratification and streaming processes. TIES data will be used to describe the trajectories of native-born descendants of immigrants from Turkey in Amsterdam and Strasbourg. Examining these education systems and the rules of stratification first will help us to interpret pupils’ motivations, orientations and practices. The second part of this chapter concentrates on the qualitative interviews with native-born descendants of immigrants, and respondents’ reflections on the stratification process and their experience of it. It studies the extent to which separate educational streams pre-ordain the outcomes of transition by providing discrete institutional structures that produce different forms of capital that are crucial to labour market transitions. Furthermore, reflecting on the initial transitions untangles the role of the cultural capital that parents were able (or not) to provide during the transition process and how it varied across the two settings that we studied. We see how young people’s motivation is influenced by their having a lower social class background and gendered values about education and work in combination with the support mechanisms they can rely on at home. This enables us to identify the early impact of social class, gender and the formations of cultural capital on the future transitions of young people as the tracking outcome has long-lasting effects. Compared to other aspects of educational systems, stratification has a strong impact on young people’s transitions from school. Durkheim ascribed two main functions to education systems: socializing young people and selecting them for adult roles as citizens and workers (Emirbayer 2003). Therefore, the ideal of meritocracy is fostered through training, whereby education systems are assigned the responsibility of sorting young people into different occupational roles while supposedly eliminating the effect of social backgrounds on the outcome, thereby enhancing equality of opportunity (Lauder et al. 2006). However, due to persistent educational inequalities, there is a debate on whether education systems remove or reproduce inequalities. While the controversy about the reproductive versus the democratizing effects of education systems persists, schools continue to operate as legitimate “sorting machines”, selecting students for their future occupational roles. On the one hand, schools officially stream students into different educational tracks based on “merit”. On the other, a subtle, covert differentiation operates through parental social background which may lead parents to make better or less well-informed choices regarding schools or subjects, which translate into advantages (or disadvantages) for their children. The most official of these two sorting mechanisms is educational stratification through streaming into tracks. Allmendinger (1989) defines educational stratification as the designing of education systems to divide pupils into different vocational and academic tracks with varied outcomes and rewards. Stratification decisions are officially based on meritocratic selection, such as tests and student grades. Previous studies have also associated educational stratification with the occupational specificity of vocational tracks. Mueller and Shavit have shown that most stratified education systems also provide vocational education that offers training in occupation-specific skills that are recognized by employers in the labour market (Mueller and Shavit 1998). Moreover, it has been argued that in highly stratified systems with vocational specificity, vocational students experience a smoother transition to the labour market (Kerckhoff 1995; Maurice et al. 1986; Mueller and Shavit 1998). Nevertheless, this condition also depends on the labour market conditions at the time of the transition. In the current study, the Dutch education system is classified as being highly stratified, providing occupation-specific vocational training through a combination of in-school training and intensive internship periods. In contrast, the French system is classified as being less stratified, with different forms of vocational training encompassing both apprenticeship programmes and school-based training with modest internship periods (leading to the BEP diploma) (Mueller and Gangl 2003). There now follow descriptions of the streaming processes in the Dutch and French education systems in light of the above-mentioned theories of stratification. Each stage of these educational trajectories is augmented by descriptive information on the educational experiences of descendants of immigrants from Turkey using the Amsterdam and Strasbourg TIES data. The data provides rich and detailed educational histories for all respondents that help to describe educational flows. In the Netherlands, pupils are streamed into different educational tracks around the age of 12 when they enter secondary school. Previous studies have therefore classified the Dutch education system as “highly stratified” (Van De Werfhorst and Van Tubergen 2007). The tracking decision is generally based on both the scores of a test, known as the CITO test, taken in the last 2 years of primary school and the advice given by the primary school teacher.2 While it is argued that the test score is the most decisive element in the streaming decision (Luyten and Bosker 2004), teachers can greatly affect the choice of educational stream by over or under-advising (Hustinx 2002). After streaming, students attend a “bridge class” (brugclass) for one or 2 years, where they are given the opportunity to change track. After the bridge year, students are selected into a secondary education track. These tracks are divided into three main streams with varying orientations, durations and levels of selectivity. Each track provides access to different higher education opportunities (see Fig. 2.1). The first track is the vocationally-oriented lower general track (voorbereidend middelbaar beroepsonderwijs, or VMBO). In the past decade, all the vocational tracks, namely lower vocational education (VBO) and the lower general track (MAVO) were merged to form VMBO. This track now offers four separate learning pathways, ranging from VMBO-basis (the most basic) to VMBO-theoretic, the most advanced or selective stream.3 This vocational education lasts 4 years and prepares pupils for post-secondary vocational education and training (middelbaar beroepsonderwijs, or MBO) (see Fig. 2.1). The second stream is the general intermediate track (hoger algemeen voortgezet onderwijs, usually referred to as HAVO), which lasts 5 years and gives pupils access to higher professional education, also referred to as tertiary vocational college or education (hoger beroepsonderwijs, or HBO). The third and most selective educational track is the pre-university track (voorbereidend wetenschappelijk onderwijs, or VWO). The pre-university track takes 6 years and grants students direct access to university education (wetenschappelijk onderwijs, or WO). Despite this early stratification process, the Dutch education system does allow for mobility between different tracks during secondary education. As a result of the “bridge year”, the track decision can be modified and pupils can also try to switch tracks throughout secondary school. VMBO students can transfer to HAVO in the fourth year of their study, and HAVO students can access VWO during fifth grade. Figure 2.1 depicts educational flows in the Dutch education system using the TIES sample for Amsterdam. In this figure, the streams illustrate the flows of students. The figure should be read as 100% of the students entering the system and shows us how they are streamed through the system. Suárez-Orozco and Suárez-Orozco (2009) described streaming in the US education system using the metaphor of a “pipeline” to illustrate how students “leak” from the education system. Here, the intention is both to clarify the tracking system in the Netherlands (Fig. 2.2 refers to France) and also to show which pathways young people take in their educational trajectory. It incorporates all the respondents of the TIES Survey: the statistics in black represent the sample of native-born descendants of Turkish immigrants and those in red represent the comparison group, respondents with native-born parents, to give an indication of the trends within the general population. Those who hadn’t left the education system remain clustered in the boxes depicting their current education level. Those who had left the education system are in the ‘leave school’ box. After primary school 72% of native-born descendants of immigrants from Turkey were tracked into VMBO, while 14% pursued HAVO and another 14% entered VWO.4 Even though the system allows for some permeability, when we look at intra-trajectory movements, not many students experienced mobility across secondary educational tracks: for example, 1% of all these respondents experienced upward mobility from VMBO to HAVO, while 1% underwent downward mobility from HAVO to VMBO, and 1% experienced downward mobility from VWO to HAVO. The distributions are strikingly different for the comparison group with native-born parents, where we see that 34% accessed the vocational track, 45% accessed VWO and 21% entered HAVO. Mobility within tracks was also low among this group during secondary education. After graduating from lower secondary school, pupils from the VMBO track begin post-secondary vocational training at an MBO, as a VMBO diploma is not a qualification in itself but only lays the foundation for vocational training. In the Netherlands, MBOs provide school-based vocational training with lengthy internship periods. MBO comprises four different qualification levels: the lowest two levels (niveau 1 and niveau 2), do not require diplomas or prior qualifications for entry. Furthermore, MBO-n2 is set as the minimum qualification (startkwalificatie) for entering the labour market. MBO level 3 and 4 (niveau 3 and niveau 4) both require a VMBO diploma. Furthermore, Dutch vocational training provides substantial hours of internship experience, during which young people gain experience of their future occupations. Some studies therefore describe the Netherlands as a country with employment logic (Iannelli and Raffe 2007), as there is a strong coupling between the skills gained in the work place and labour market requirements, giving pupils considerable transparency with respect to their credentials. In the coming sections we will discuss how this job experience has the potential to lead to the development of different forms of capital among the respondents. According to the TIES data, streaming works as most students pursued their institutional trajectories, with the exception of the 13% of respondents with Turkish immigrant parents who left school before entering MBO. However, the majority of students followed their tracks into the assigned institutions, and this was especially the case among those in higher general (HAVO) or pre-university (VWO) tracks. The Dutch education system also provides channels for those who received vocational education to attend university. Graduates of post-secondary vocational training (MBO) can access higher professional education colleges (HBO), and even enrol at university after graduating. In practice, those with any kind of MBO n-4 diploma can gain access to all tertiary education institutions. However, they will still have to study for another 4 years to obtain a tertiary professional degree (HBO), and an additional 2 years if they would like to acquire an MA. As a result, even though young people selected into vocational tracks are given this opportunity, they would have to spend an additional three to 5 years to achieve a higher education diploma. In a recent study using the Dutch national data set, Tieben and his colleagues (2010) showed that the majority of pupils pursue the educational trajectory they were initially streamed into and only a minority switch tracks and achieve upward mobility. According to a recent report from the Ministry of Education, 14% of MBO graduates went on to graduate from a HBO college (Altinyelken et al. 2010). In the TIES data for Amsterdam, 13% of the respondents accessed HBO via MBO, although this only shows attendance at an HBO rather than attainment rates. At the time of the TIES survey, nearly half of the HBO students were still at school, so overall graduation rates are hard to determine. If holders of an HBO diploma would like to pursue their education in the same area of study, their qualification counts as a bachelor’s degree, and they are only required to conduct 1 year of pre-master’s preparation before studying for a master’s degree. Unlike the French system, there are no institutionally recognized differences between higher education institutions of the same type in the Netherlands. However, among the two main types of tertiary education institutions, universities are perceived as being more prestigious than vocational colleges (HBO). In the TIES data for Amsterdam, the majority of respondents who had successfully accessed university education originated from VWO tracks. All in all, out of the 100% who entered the education system, 10% of the sample of native-born descendants of immigrants from Turkey and 29% of the comparison group enrolled in university after finishing VWO. 3% of native-born descendants of immigrants and 11% of the comparison group accessed university through HBO (see Fig. 2.1). In France, the education system is organized into three broad tiers: pre-school education, primary to lower-secondary education, and higher education. In contrast to the Netherlands, the French state provides public pre-school education, which begins at age three and marks the starting age for almost 99% of children in France. Previous studies have shown that participation in pre-school education makes a significant contribution to reducing the risks of failure or repeating classes during primary school (Duru-Bellat 2000). Primary school begins at age six, and is the first stage of compulsory education. According to the TIES data, native-born descendants of immigrants from Turkey living in Strasbourg follow similar patterns: 99% attended pre-school education, whereby the mean starting age was 3.08. Nevertheless, 42.7% repeated at least 1 year during primary school, compared to 27% of descendants of Turkish migrants in Amsterdam. The French education system provides a comprehensive education until the end of lower-secondary school (collège), when the most critical selection occurs. The last year of collège is known as troisième. At the end of this year, around the age of 15, students are sorted into different academic and vocational trajectories. This process is called orientation, during which a “class council” (conseil de class) composed of teachers and school officials gather to decide which stream pupils should be assigned to. Class councils consult the family and also take student grades into account, as well as the outcome of the brevet des collège or BEPC exams.5 After these consultation rounds, the class council reaches a final decision that parents can appeal against (Durier and Poulet-Coulibando 2007).6 As a result of the orientation process, students are streamed into two lyceum-based tracks: academic or vocational. Academic lyceum lasts for 3 years. In the first year, students attend uniform training (seconde). At the end of seconde, pupils must choose between the general or technology tracks, which prepare them for the baccalauréat général (bac général) or baccalauréat technologique (bac tech.) diplomas respectively. Of the two, the bac général diploma is deemed the most prestigious, though both allow direct access to university or other higher education institutions, as well as to the preparation classes for the most prestigious universities (grandes écoles). In contrast to the 4-year vocational training given in the Netherlands, French vocational lyceums provide only 2 years of training, combining general education with specific technical skills to prepare pupils for entry into the labour market. Once more, vocational education is divided into two tracks. Young people study either for the Certificat d’Aptitude Professionnelle (CAP) or the Brevet d’Etudes Professionnelles (BEP). The CAP diploma requires apprenticeship periods and is deemed less prestigious than the BEP diploma, which is a school-based vocational training programme with few internship periods. BEP holders can attend an additional 2-year professional lyceum to obtain the baccalauréat professional (bac pro. ), which gives vocational students the opportunity to enter higher education. Furthermore, since the reforms of the 1980s, French lyceums have seen a significant increase in attendance as the number of young people gaining the baccalauréat has increased from 20% in the 1970s to 62.5% in 2005 (Eurydice 2008). This growth was achieved by the creation and promotion of alternative forms of baccalauréat diploma, rather than an increase in the number of pupils obtaining the prestigious bac général (Duru-Bellat and Kieffer 2008). Figure 2.2 illustrates educational flows among the TIES sample in Strasbourg. It shows that after lower secondary education (collège) 54% of the sample of native-born descendants of immigrants from Turkey were assigned to the lower secondary education vocational track of upper secondary education which leads to either a CAP or BEP diploma, while 38% were assigned to the academic track (lyceums). 8% had already dropped out of education during or after collège. If we read the streaming graph and round off the percentages, the figures show that 54% of the students entered CAP/BEP, and, from there, 20% left education after attaining their vocational diplomas (either CAP or BEP), while 10% eventually left without a diploma and 14% attended lyceum. Among those who were selected into the academic track (38%), at the end of the first year (seconde) 20% went to the general lyceum to study for the bac général and 18% entered technical lyceum to study for their bac tech diploma. Once more, these trends contrast with those of the comparison group: the majority of French-origin respondents (82%) entered the academic track while only 16% entered the vocational track, and only 2% left education after collège. Among those who went to an academic lyceum, the majority (68%) enrolled in general lyceum and 14% went to a technical lyceum. These trends accord with previous studies that show lower educational attainment among descendants of Turkish immigrants in France (Brinbaum et al. 2012; Silberman et al. 2007). In France, some higher education institutions are clearly more prestigious than others and there is rigorous competition (concours) for admission to certain universities (grandes écoles) (Kieffer 2008). A lyceum diploma (baccalauréat) is not sufficient to gain admission to one of these universities. Candidates must take supplementary exams and not only exam results, but the kind of lyceum diploma they hold is of crucial importance.7 Despite increased participation in higher education among the children of immigrants and working-class parents, these groups are still under-represented in the grandes écoles (Brinbaum and Cebolla-Boado 2007; Brinbaum and Guégnard 2011; Duru-Bellat and Kieffer 2008). Students wishing to access engineering and social sciences courses at a grande école must attend highly selective 2-year preparation courses (CPGEs) before the competitive exams. These courses mostly select bac général holders with excellent GPAs. However, regular universities (DEUG under the old system, lisans or master in the new system) are non-selective (with the exception of medical schools), just requiring a baccalauréat diploma. Additionally, the 2-year tertiary schools such as STS or IUT are also somewhat selective. IUT schools are intended to train good students with bac général or bac tech. diplomas for the university technology diploma (DUT). Students can progress from IUTs to do a master’s degree or even to a grande école if their grades are high enough. STSs prepare students for the vocational tertiary diploma (BTS), and were initially designed for bac tech. holders, though they have become popular among all baccalauréat holders. One important reason for BTS’s popularity is the dual study option (BTS and Alternance), whereby students combine work with study and experience smooth transitions into the labour market (Bidart and Pellissier 2002). When we look at how young people continue their education after stratification, Fig. 2.2 illustrates that 18% of the native born descendants of Turkish immigrants in the sample went to lyceum tech; 3% were still studying at the time of the survey; 5% graduated with a bac tech diploma; 1% did not obtain a diploma and left education; 9% enrolled in semi-selective 2-year vocational colleges to obtain a BTS or DUT diploma (see yellow arrow) and 3% went to university (green arrow). Students in general or technological lyceums follow pre-ordained patterns, with those holding a bac général preferring non-selective universities over vocational colleges. In contrast, those holding a bac tech. entered vocational colleges more often than universities. As in Amsterdam, most TIES respondents in higher education were still studying at the time of the survey, making it difficult to determine accurate completion rates for higher education. Nevertheless, among those who finished, we see that 7% of the descendants of Turkish immigrants left education with a university diploma and 6% obtained a vocational tertiary education diploma (BTS/DUT) compared to 29% and 11% of the comparison group. From both groups only a small minority gained entry to a grande école; 7% of the comparison group and 1% of the sample of native-born descendants of immigrants. We have seen that the Dutch education system streams a large majority of native-born descendants of immigrants from Turkey into vocational education. By contrast, in Strasbourg a considerable group (38%) accessed academic training. This finding accords with the TIES research as a whole, which also encompassed Paris and Rotterdam data sets (Crul et al. 2012). Nevertheless, many studies have highlighted the descendants of immigrants from Turkey living in France as among the most disadvantaged second generation groups (Brinbaum et al. 2012; Silberman et al. 2007). However, when compared to the trends of stratification in Amsterdam, those in Strasbourg still seem to do better academically. With regard to permeability, or the extent to which pupils can move across tracks, the majority of young people seem to continue their institutionally pre-conditioned educational pathways in both countries. In Strasbourg, only 13% of the entire sample of native-born descendants of immigrants from Turkey accessed university via the long vocational track compared to 8% who accessed university or BTS via professional lyceum. Thus, even though the French system is classified as being less stratified and more comprehensive due to its later tracking, the outcome of the process has long-term implications in Strasbourg just as it does in Amsterdam. Despite differences across the systems, this shows that the tracking moment is crucial in the trajectories of young people in both settings. Both the effect of tracking on transition and the permeability of tracks are two crucial issues for the interpretation of the qualitative data. Bol and Van de Werfhorst (2013) have recently illustrated that, while a high level of tracking in a national education system leads to better labour market allocation for young people, it also contributes to unequal educational opportunities since social class background has a greater effect on tracking in such systems. The following analysis of the in-depth interviews seeks to discover how young people in both cities relate to their initial tracking decisions, the role played by their parents and significant others and the forms of capital they could rely on during the tracking process. SERDAR: It’s not like I chose between MAVO or HAVO, I was sent to MAVO because this was my level. Is it possible to say that the respondents in Amsterdam “chose” either a vocational or academic track? The majority of the participants in the qualitative study argued that their test score8 at the end of primary school (CITO) was the most significant determinant in their streaming. At that point of stratification, hardly any of the pupils referred to their motivations or orientations regarding schooling. For them, their track reflected their “education level” rather than their choice. Hardly any of their parents had been actively involved in the decision-making process. Hence, according to the respondents, the “choice” had been made by the “school and/or the test score” on the basis of “merit”. Those respondents who had been high achievers throughout primary school scored well in the CITO test and thus made a direct transition into academic tracks, due to either their high grades or their prior placement in the “smart kids” clusters. Other pupils were mostly advised to enter the vocational track, where they remained unless teachers or significant others intervened in their educational destinies during their later school trajectories, such as in bridge year. Gülden, the youngest child of Turkish immigrant parents, was initially tracked into vocational education. The part of her educational career that she particularly enjoyed was her apprenticeship and work experience and making a smooth transition into the labour market after receiving her MBO diploma. Among her siblings, she was the only one who acquired a vocational diploma, and is hence the highest achiever. INTERVIEWER: What do you think about the stratification process at the end of primary school? GÜLDEN: In fact, it is a good system, since everybody receives training at his or her own level. INTERVIEWER: Do you think that people are sent to the right levels? GÜLDEN: Well (pauses) I hear that students receive high grades but they are advised into lower tracks. I didn’t experience anything as such. But still there is the bridge year. You are given a chance to do HAVO during this year. Gülden underlines the two compelling institutional discourses in the Dutch education system: The first is that the streaming decision is based “almost entirely” on educational success, and hence everyone is sent to their “own level” of education; the other is that the system provides opportunities to switch tracks later. This discourse was echoed among other respondents. Hakan had been tracked into the vocational stream and was a last-year MBO student at the time of the first interview. When asked about tracking, he associated “test results” with “capacity”, meaning whether a student is able to manage a given track, and he also relates “smartness” to attending an “academic lyceum”. Hakan defines the role of (education) systems as sorting people into appropriate levels. HAKAN: I think it is good because they do a capacity test; they check your level. Can this boy or girl make it? Then comes the advice. I think CITO is most important; it shows what you (can) do. INTERVIEWER: Do you think the selection is done fairly? HAKAN: I think so, because if it was like Turkey... I mean, whomever I ask in Turkey, they say they are doing academic lyceum. I ask myself; are these people that smart? Or is there no system? Moreover, the pledge that pupils will always have the opportunity to prolong their studies and upgrade their trajectories if they improve their educational success over time is successfully transmitted by teachers. Tülin’s mother had serious health problems during the CITO period, so she scored poorly in the exam, and was advised to follow the vocational track. Her aim was to reach HAVO. Her teachers convinced her that she could always pursue her studies in the future. The structure’s restrictions and the pupils’ varying motivations were balanced by the discourse of flexibility embedded in the system. On the one hand, the premise of flexibility is committed to re-introducing “agency” into educational decision-making, and on the other hand it emphasizes the agent’s responsibility in shaping their educational career. These discourses were internalized by my respondents and are evident in their accounts of their own educational careers. Even though some students questioned the accuracy of CITO in measuring educational capacity, they were generally confident that the selection process functioned quite directly on the basis of one’s test score or “merit”. In Strasbourg, the strong emphasis on merit and the tight coupling between test scores and streaming decisions were not as evident in respondents’ accounts, while orientations and future motivations regarding work or studying seemed to play a significant role. In Strasbourg too, the transition decision was primarily based on the pupils’ grade point average (GPA) during lower-secondary education (collège).9 However, the respondents also talked about their orientations and motivations with respect to the tracking decision. In the respondents’ experience, all of the pupils had selected institutions they would like to attend and this selection was evaluated by the class council on the basis of their educational history in the institution. In the academic track, the high-achieving students once more made a direct transition into academic lyceum. Can and Ayla had scored remarkably high grades throughout primary school and collège, and were the highest achievers in their class. Can had even skipped a year during primary school. During the orientation process, they were directly advised to attend a general lyceum. The patterns were more mixed for students with an average GPA, some of whom qualified for the academic track. One group of students had good grades and families who encouraged them to take the academic track. Furkan had above-average grades throughout collège and was advised by his cousin, who attended university and knew how the system worked, to attend an academic lyceum. He said he would have chosen the vocational track if she hadn’t influenced his decision. Likewise, Selvi and Sevgi were steered towards the academic track by their fathers, who were well informed about the education system. The striking role played by families or significant others will be studied in the following sections. SELAHATTİN: My GPA was something like 13 or 14 [/20] at the end of collège. INTERVIEWER: What was the decision of class council? SELAHATTİN: Well, they just review your (school) selections and they give a report of the final decision. In my case, they said nothing because I had already chosen BEP in construction (vocational track) and they were OK with it. INTERVIEWER: How did you choose BEP construction? SELAHATTİN: Well I had heard about the job and liked it. And my grades, well, they were OK, but I wasn’t sure how far I could continue with them. INTERVIEWER: So you had sufficient grades to access the academic track? SELAHATTİN: Well, I am not sure, but also after general (academic lyceum), you have to continue two to three years. I don’t know, it was hard. INTERVIEWER: What did your parents say? SELAHATTİN: Nothing. They said do what you want to do. According to students like Selahattin, the academic lyceum and the baccalauréat diploma were vague options that entailed too much risk. Cengiz, another pupil who had good grades but followed the council decision to pursue the vocational track highlighted this uncertainty “you can’t do anything with a bac; you don’t have any occupation”. Şebnem went to vocational school with a close friend. After they had obtained good grades in the vocational track and acquired a BEP diploma, they were advised to do a vocational baccalauréat. Having got their bac, they decided to enrol in university. In fact, Şebnem’s ambition to study further was influenced at every step by her risk-averse attitude; she was cautious about taking one step at a time and climbing the ladder gradually by making sure that each step was guaranteed, and she also received considerable support from her peers, teachers and family. Comparing the experiences of the respondents in two distinct systems we see that while the postulation of “meritocratic selection” dominated the discourses of respondents in Amsterdam, the merit argument was not as straightforward in Strasbourg. In Amsterdam students had hardly any doubts about the returns of an academic track or its prestige; they were certain that higher degrees would lead to better labour market outcomes. Hence the tracking outcome was reasoned along a meritocratic discourse of whether one is able or not to access such tracks. In Strasbourg, young people talked about their motivations or perceptions to study in a given track. This was primarily related to the fact that some of my respondents in Strasbourg had doubts about the returns of the academic track, which did not guarantee transparent returns in the labour market. They perceived the shorter vocational route as providing more directly job-related skills. This condition was also heavily circumscribed by the respondents’ social class background and the gendered pressures to earn an income swiftly that were mostly felt by young men. While the social class background of the respondents in Amsterdam did not vary from those in Strasbourg, the education systems signalled different realities to both groups. Most respondents pointed to the concept of “merit” to explain their tracking decisions. Nevertheless, what merit actually is has been a subject of intense debate. Merit is often conceptualized as intelligence paired with effort (Luyten and Bosker 2004). However, subsequent studies have repeatedly shown that merit is neither free from social class nor by itself a determinant in educational outcomes (Lauder et al. 2006). In a recent study of children of immigrants living in the Netherlands, Van de Werfhorst and Tubergen (2007) illustrate that neither the pupils’ academic ability nor their tracking decisions are solely based on merit, but are rather dependent on the social class of their parents. As a result, even though the Amsterdam respondents felt that the tracking decisions were based on “merit”, this is not in fact independent of one’s parental background and home upbringing. Bourdieu argues that one’s educational talent—“merit”—is “itself a product of an investment of time and cultural capital” rather than a “natural aptitude” (Bourdieu 1985) (p. 47). This investment is provided within the family habitus over time, though “the scholastic yield from the educational action depends on the cultural capital previously invested by the family.” (ibid) (p. 48). As a result, it matters a great deal what kind of cultural capital is invested in the family and how this capital is valued by the education system. It also requires parents to spend time with their children in the family setting. Bourdieu talks about three forms of cultural capital: embodied, objectified and institutional. The most vital is the embodied form of capital, in which not only language but also certain behavioural patterns are incorporated into the body and mind of children over time. This does not require inculcation but can simply occur unconsciously. Academic diplomas or other cultural goods—the objectified state of cultural capital—are defined and valued only by their relation to cultural capital. For Bourdieu, the match between the cultural capital inculcated at home and what schools expect in terms of cultural capital in the classroom explains the ongoing reproduction of middle-class advantage. This becomes evident in Deniz’s account. Her first generation parents mobilized all their means to support her education, but fell short of providing an appropriate family habitus compared to some of Deniz’s classmates. At primary school, Deniz’s teacher asked one of her French classmates to help her out with her homework. Deniz would go to her friend’s home and spend some time with her and her mother. DENIZ: During primary school, my teacher tried to help me improve my grades. The girl sitting next to me was the best student in the classroom. The teacher asked her parents, who were both French, whether I could visit their house after school, like twice a week for one or two hours, in order to do my homework. They accepted and so I went. It was completely different from our house. In our house when we came home from school we would wash our hands, wait for my father to come from work and we would have dinner together. Then everyone would sit down and do their homework. As much as we could, you know. But in my friend’s house it was much different. First her mother would prepare something for us to eat, like a small snack. Then she would ask us about our day and what we had done at school. She would ask one question to her and then one question to me. Then she would ask us to show what we had done at school, like the stuff in our school bag. We would repeat what we had done. This was not possible at our house. Plus I mean, they speak French, this is an incredible advantage. Deniz’s classmate and her French parents would perfectly fit Bourdieu’s theory of middle-class reproduction of advantage. Clearly, due to their lower social class and migration background, the majority of immigrant parents from Turkey do not and cannot possess the same cultural capital as middle-class Dutch or French parents. Many migrants go through “a devaluation of non-recognition of their skills” (Erel 2010, p. 643). Research has shown how migrants encounter difficulties in translating their social and cultural capital at home to the host country when assisting their children’s education (Hagan et al. 1996). Nevertheless, the question remains of how to understand the input of Deniz’s parents or other immigrant parents in their children’s education, and especially how they influence the decision concerning their child’s streaming. In both settings, some Turkish parents tried to support their children’s education through a positive attitude towards education, by choosing the right school for their children and providing external support mechanisms via family networks or elder siblings (Rezai et al. 2015). The choice of school was one way in which parents could influence their children’s education. Most parents in our study sent their children to schools in their neighbourhood. In both Amsterdam (Karsten 1994; Karsten et al. 2003) and Strasbourg (Fabert and Raluy 2002), a large proportion of immigrant families live in segregated neighbourhoods and attend local schools which reflect this population balance. Such schools are seen as an extension of neighbourhood ghettoization since most parents send their children to a “nearby” school (Karsten et al. 2003). In Amsterdam, 11% of students go to a school where the majority of pupils come from a non-Dutch background (Booi et al. 2009). This percentage goes up to 37% in some of the older neighbourhoods in the west of the city, where most respondents resided (ibid). In Strasbourg also, most respondents and their families resided in majority-minority neighbourhoods (Fabert and Raluy 2002). Although education priority policies (zone d’éducation prioritaire (ZEP) have been in force in France for almost 30 years in order to fight poor education in deprived neighbourhoods, they have not produced as many positive outcomes as expected (Mellottee et al. 2010). When it comes to choosing schools, in the Dutch context, parents are given the freedom to choose their children’s school (Karsten 1994). However, this right also leads to an increased concentration of children of immigrants at particular schools, which is compounded by the fact that most native-born parents remove their children from schools with high numbers of pupils with immigrant parents, leading to effective “segregation” (Karsten et al. 2003, 2006). In France, by contrast, parents are required to send their children to a school in their postcode area (Mellottee et al. 2010). However, this restriction leads to the formation of ghetto schools in suburban neighbourhoods, while native parents find alternative ways to manipulate their children’s school choice via course selection or by sending them to private schools (Zanten 1997). In line with these trends, one group of respondents’ parents had developed cultural and linguistic capital by virtue of their earlier arrival in the Netherlands or France: these were the 1.5 generation parents. This extra time spent in local educational and/or occupational institutions helped these parents to develop what Bourdieu, in a more general description of cultural capital, calls “information capital” (Bourdieu and Wacquant 1992, p. 119). Although most of these parents were still not able to fully assist their children with their homework, they had become fluent in Dutch or French and possessed information capital which distinguished them from other parents with poor language skills or little idea of how schools or the labour market function. The interviews showed that the common educational strategy of these parents was to send their children to prestigious schools with a low number of descendants of immigrants. Affecting the choice of educational institution in this way requires a certain amount of informational capital on the part of the parents. Karsten and his colleagues (2003) showed that while native-born parents tried to find schools that matched their home habitus, immigrant parents did not necessarily seek such a match. Instead migrant parents tried to avoid segregated schools with poor reputations and selected schools with good reputations. Several examples of this experience were found among the qualitative interview respondents: Hakan’s mother arrived in the Netherlands at the age of 12, received vocational training and was working as a bus driver. Before Hakan started school, both his mother and her aunts researched the best schools in Amsterdam and sent him to one of them. Gül’s father, who came to the Netherlands at age 15 and studied here, sent her to a prestigious primary school in south Amsterdam. Both of Bulut’s parents came to the Netherlands as 12-year-olds, and moved from west to east Amsterdam in the hope of providing better educational opportunities for their children. Engin’s mother arrived in Strasbourg at the age of 12, and Fahri’s father at 14, and both their families lived in suburban districts. As they lived in segregated neighbourhoods where the majority of pupils at the local schools were children of immigrants, both parents sent their sons to private colleges. Veli’s father had arrived in Strasbourg at the age of 13 and received some vocational training. When Veli started secondary education, he made arrangements to move to a village near Strasbourg where there was a prestigious school. GÜL: Actually, I was capable of doing VWO, but the teachers didn’t think I was fit for it, you know, because they said that I had low concentration; I was too talkative. They were right. I am smart, but maybe I don’t put my brain to good use (giggles). HAVO was so easy; I got all my exams by barely studying. INTERVIEWER: How was your CITO test? GÜL: It was the highest in my class. It was VWO. I mean, I could have done VWO, but back then you didn’t think of these things. I was 12 or 13, you know. INTERVIEWER: How about your parents? GÜL: Well, they were happy that I was studying at all. I would just stop by my parents at the end of each year. They weren’t really (involved), you know. Thus, despite their efforts to choose a good school, the prestige difference between HAVO and VWO went unnoticed by her parents according to Gül. As she mentions in her quote, Gül hardly needed to make an effort during HAVO and passed all her exams with ease. She was clearly able to study in the most prestigious academic track. At the time of the interview, she was finishing her HBO degree and considering pursuing a pre-master and then an MA degree. By contrast, parents in Strasbourg who had information capital about the system were not only able to intervene in the choice of a school for their children, but could also influence their children’s tracking decisions. Selvi, Ümran and Sevgi all had 1.5 generation parents who were well-acquainted with the higher prestige level of academic lyceum. Furkan and Veli were steered towards an academic track by their elder siblings or relatives. Once they had achieved the required grades at collège, family members were there to help them reach the academic track. Sevgi, who was a vocational tertiary school (BTS) student at the time of the interview, almost complained of her father’s assertiveness with regard to academic lyceum. SEVGİ: I also have a twin brother, and since we went to collège, it was never in question that we would have to do (bac) général. My dad was obsessed about us going to university, and he knew the best way to go was through général (lyceum). He came here young, you know; he couldn’t study because he couldn’t speak French in the beginning. Now his French is great but he couldn’t study enough. He has a good business and everything, but he wants us to study. VELİ: Well, anybody can go to university. There is no problem there. As long as you have a bac diploma of course. But, you know, they have a hidden system. Of course, a university diploma is not bad; it shows that you have a certain level of education, as well as a certain cultural standing. But, you know, there are these schools that the statesmen and MPs attend. INTERVIEWER: You mean the grandes écoles? VELİ: Yes, exactly. For example, in Strasbourg there is one famous one; ENA. I mean, for people like us, it is impossible to enter these (schools). VELİ: Well, our parents came here as immigrants. My grandfather came here first. My father was 13 when he came. He did vocational school here. He speaks very good French. He started his own business, and he achieved a lot. I mean, he does everything for his family and his kids. But it’s my mum who was at home, raising us, and she speaks no French. I mean, at home we all speak Turkish. Yeah, we went to school, back and forth, but we achieved everything on our own. University is as much as we can achieve. For our kids, it will be different, since we know about these schools now. During lyceum, I wasn’t even aware that they existed. After I found out, I considered trying, but then I thought it would be too difficult. Bourdieu also refers to cultural capital as informational capital since it relates to having symbolic information about the rules of the field (Bourdieu and Wacquant 1992). We have seen that some immigrant parents have developed some cultural capital with respect to how the education system functions, thanks to their early exposure to the host countries, their relations and exchanges in education and the labour market. Yet the composition and magnitude of this capital is rather limited when it comes to influencing their children’s educational trajectories. This limitation was also enforced by the rules of the (tracking) game in the education systems. How parents with comparable levels of cultural capital could influence the tracking decision varied significantly across settings based on the rules of the field: in Amsterdam, the parents’ role was limited to school selection, while in Strasbourg, parents were more able to manipulate their children’s orientation and the school’s decision during the streaming process at the end of collège. When studying the educational and occupational mobility of second-generation groups, Portes and Fernandez (2008, p. 26) emphasized the role of persons they called “really significant others”. These include teachers, counsellors, friends or family members, who know the rules of the game in the education system (therefore possessing information capital) and intervene in the educational decisions of the second generation to turn these rules to their advantage. Especially in the absence or limitation of parental cultural capital, some teachers played a significant role in overturning the educational destiny of pupils in both settings. SERDAR: I think I went to a terrible primary school. Because of this, everything that I was supposed to learn in primary school my German teacher taught me in brugklas. I really owe it to him. Some of the teachers in Strasbourg also intervened in the streaming selection process. Both Deniz and Engin had grades that qualified them for entry into the academic track, but their selection was declined by the class council. Deniz’s history teacher intervened in the decision, saying that the class council would only send Deniz to the vocational track “over her dead body”. The teacher not only reversed the council decision, but also made sure that Deniz gained access to the most prestigious lyceum in Strasbourg by manipulating the choice of institution. In fact, the class council decision was made on the grounds that Deniz was a hard-working student who had only achieved high scores by making an immense effort in collège and would struggle to manage in general lyceum. Deniz reported that she found lyceum difficult, but nevertheless managed to graduate and enter tertiary vocational education (BTS). At the time of the survey she was a successful businesswoman. Similarly, Engin’s teacher opposed the council’s decision and arranged for Engin to attend a preparation year at a lyceum so that he could transfer to the academic track. The interviews generally showed that in the absence of parental assistance or significant others, it was those with average grades, rather than the high achievers, who suffered from the system. In both settings, the system had a tendency to discourage average achievers. Family support could balance this effect, but if there was a lack of parental support, average students risked being under-advised into vocational tracks unless there was a teacher or other institutional actor on hand to support them. CEMRE: I think we grew apart. I mean, there is a difference now. Because most Turks here, they do MAVO (vocational track) and then they do MBO (post-secondary vocational education). But those with HBO, they have a difference of “understanding”; how should I say it? A different world-view. We think more openly and they think more traditionally. About everything: work, relationships, education. Cemre’s higher education experience helped her to develop linguistic and cultural capital that is valued in the Dutch labour market. She has internalized dispositions such as independence and reflexive thinking as well as linguistic capital, all of which are vital to her upward mobility. Furthermore, Bourdieu discusses how one form of capital can be transformed into another as it reinforces itself (Bourdieu 1985). Students in higher education also receive the opportunity to convert their educational capital into social capital as they interact with more students from the majority group. Native-born descendants of immigrants from Turkey form a majority in secondary and vocational schools in certain neighbourhoods, but their numbers shrink drastically when they progress into higher education. Once there, some build lasting contacts with young people with native-born parents. In Strasbourg, Can had gone to an elite academic lyceum with the help of his teachers. He had developed close friendships at school, and these were instrumental to his gaining practical information about how to enter a grande école. Most of his friends with high-status parents had entered the preparatory classes for the grandes écoles, while Can had gone directly to a non-selective bachelor programme at the University of Strasbourg as his parents did not know about the preparatory classes. Nevertheless, he sustained his contacts with his friends and, after gaining his BA, he applied to study information technology at a grande école in Paris where all his friends were studying. This differs from the role played by a “significant other” as Can converted his cultural capital to social capital as a result of attending an academic track. He was the only respondent in my sample who was able to attend a grande école. While entering an environment dominated by Dutch or French students with native parents might have had positive consequences for some respondents, for those who couldn’t manage to adjust, it could also be detrimental. In Strasbourg, Ayla was a remarkable student throughout her primary and collège education. She even received a special prize at the mathematics Olympics. During her transition to lyceum, not only was she sent to the most prestigious institution, but was also placed in the highest educational stream, the scientific track (Baccalauréat scientifique in French). However, Ayla found her new school environment difficult to deal with as it contrasted sharply with the congenial ambiance of her collège. AYLA: It (friendship with classmates) was very difficult. Everyone was in competition with each other. Nobody cared about friendship. Everyone was concerned with their own thing. If they had something to ask, they would come and ask you. But when they were done with you, they would just leave. And if you have a question, they would pretend to want to explain, but they just wouldn’t care. They wouldn’t want you to be better than them, you see. Most of the pupils at a scientific track prepare for the concours to enter preparatory classes for the grandes écoles or medical school, which Ayla wanted but she found it difficult to get used to the competitive environment. Her alienation from her peers was soon reflected in her grades and she failed the baccalauréat examinations in her final year. As a result she abandoned her dream of becoming a doctor and dropped out without a diploma. Aged just 18, she decided to marry her boyfriend, even though her parents were upset by the shift in her educational career. This is an example of “habitus clivé”, a term coined by Bourdieu (1999, p. 511), whereby Ayla suffered emotionally from the mismatch between her previous habitus and the new one at her school. Working with the concept of habitus clivé among the socially mobile, Friedman (2016) underlines the significance of the speed of social mobility or the suddenness of habitus modification leading to such a cleavage, often resulting in emotional distress. In Ayla’s case, the sudden change in educational habitus at such a young age led to an emotional breakdown which resulted in her dropping out of school. Hence not all respondents benefited from a change in their habitus and some had difficulty adjusting to their new habitus. Studies on social stratification have repeatedly shown that tracking pupils has strong implications for their future educational careers and eventually for youth transition later on (Tieben et al. 2010; Van De Werfhorst and Mijs 2010). The analysis of TIES data confirms this trend and illustrates that in general my respondents were adversely affected by this tracking system both in Amsterdam and Strasbourg. Even though more respondents were able to reach the academic track in Strasbourg compared to Amsterdam, in both cities the majority of native-born descendants of immigrants were streamed into less prestigious vocational tracks. This tracking outcome largely determined the educational pathways of my respondents as only a minority managed to modify their initial track (cf. Tieben et al. 2010). The fact that tracking pre-conditions the educational pathways is a reality faced not only by descendants of migrants but also for the youth with native born parents (ibid). In explaining the initial and long-term tracking outcomes, social class, mostly measured on the basis of parental education level, is a significant determinant (Van de Werfhorst and Van Tubergen 2007). Yet despite having parents with similar, lower educational backgrounds some descendants of migrants achieve higher tracking outcomes “succeeding against the odds” to varying extents in distinct settings (Schnell et al. 2013). Hence what remains to be answered is what most quantitative studies have fallen short of uncovering: what are the micro-level mechanisms in which social class functions in making a difference among young people who seem to have parents from a similar social class background? How does parental background influence the tracking decision in Amsterdam versus Strasbourg? Using qualitative interviews, I uncovered various mechanisms with regard to the rules of the educational tracking game and the varying amounts and forms of capital that respondents could rely on at home and beyond when decisions were being made regarding the educational track they were to be assigned to within the given structures. In Amsterdam respondents attributed streaming outcome to their national test scores, rather than their own motivation or their families’ resources. The prestige and high returns of Dutch academic education appear to be undisputed, hence respondents did not hesitate about attending an academic track if they were advised to do so. For the rest, the meritocratic discourse was largely internalized, especially by those who were happy with their initial tracking decision, whether they were in a vocational or academic track. This means that most respondents agreed with their tracking advice, saying that it was based on their test performance. Despite the varied cultural capital within the migrant community and parents’ efforts to influence their children’s educational trajectories by selecting certain schools, family and significant others in Amsterdam seemed to have very little influence on the transition decision. In Strasbourg, however, parents and extended family members with cultural capital were more able to affect the tracking outcome. The motivation of the respondents (and their families) also mattered in the French context. The system’s lack of transparency led students to doubt the benefits of academic track education; hence respondents were uncertain whether going to university or vocational colleges would pay off on the labour market. This situation was exacerbated by the respondents’ working-class background and gendered values. Coming from low-income families, male respondents felt more pressured to gain economic independence. By the age of 15 they were already more inclined to select the vocational route in order to learn a profession rapidly and enter the labour market. Some students whose grades qualified them for the academic stream preferred to pursue a vocational track, and this decision was approved by the school authorities (which was very unlikely in the Dutch case). Hence in terms of overt mechanisms, it would seem as if social class and having cultural capital in the form of information capital had a more direct influence on the tracking decision in Strasbourg than in Amsterdam. This condition can easily apply to working-class youth with native-born parents since the findings point to resources that are not specific to an ethnic group. It is very likely that working-class children in Amsterdam are also subject to the Dutch system’s strict tracking process and the parents of working-class children in Strasbourg may not possess enough cultural capital to influence the tracking selection procedure unless a teacher or a significant other with information capital intervenes. What remain unexplained are the covert mechanisms at play in Amsterdam through which middle-class native-born parents might manage to exert influence on their children’s tracking outcomes. We have seen that some parents tried to select certain schools or neighbourhoods in the hope that they would yield better tracking outcomes but as we do not have a comparison group consisting of “middle class parents” in the qualitative study, these covert mechanisms remain unrevealed. Studying the way in which parents played a role in the initial tracking decision using Bourdieu’s cultural capital theory helps us identify how social class works in practice. First of all, studying the cultural capital of migrant parents requires us to look beyond middle-class bound descriptions of cultural capital (Skeggs 2004) and come up with alternative usages. It also shows that despite seeming to hold similar social class statuses in social stratification studies (cf. Van de Werfhorst and Van Tubergen 2007), migrant communities differ among themselves in terms of the forms of capital they possess. Such disguised differences are hard to catch in statistical research but are eventually revealed by using qualitative methods. Early exposure to the education and labour market system of the host country and speaking the host country’s language all resulted in some parents developing cultural capital. Even though they have not been very socially mobile themselves, they have been able to transmit advantages to their children. This also exemplifies how parents and certain significant others played a crucial role with long-lasting effects early on in young people’s social trajectories. Since 2000, the government has provided opportunities for early education for children of parents with education or language disadvantages (Eurodyce 2007). However, most of the respondents did not take up this opportunity. Eighty-five percent of Dutch schools participate in the CITO test, though some do not (Eurydice 2008). In the TIES survey, respondents had been educated under both the old and the new systems. Figure 2.1 uses the new stream name, but includes those who attended MAVO and VBO. These are the final tracks that students enter after the bridge year, so this figure excludes the stratification prior to the bridge year. Although these diplomas are not required for entrance to high school, they may influence the decision-making process (Brinbaum and Cebolla-Boado 2007). Between 2000 and 2002, only 2% of parents appealed against a council decision (Durier and Poulet-Coulibando 2007). Duru-Bellat and Kieffer (2008) show that in the 1975–1980 birth cohort access to a prestigious Grande École is 7% in the entire cohort while this percentage increases to 16% among bac général holders. The CITO test was first used in the Netherlands as an admission criterion in 1968 and its usage has continued to increase ever since. All of the respondents of this study confirmed participating in the CITO test. In order to avoid association with grades or IQ tests, CITO uses a grade scale ranging from 500 to 550. It is not possible to fail the test and each pupil’s performance is converted to a grade between 500 and 550. Pupils who score between 501 and 520 are advised to follow basic vocational training (VMBO basis), while those who score between 545 and 550 receive an advice for pre-university education (VWO). The grades are calculated based on the yearly average in college over 20 points. For example 12 over 20 is the minimum a student has to achieve to gain access to general lyceum training.